Achieve competitive financial returns and make a difference at the same time by applying the information in Compelling Returns: A Practical Guide to Socially Responsible Investing, a well-rounded guide to socially responsible investing (SRI). Understand the basics of SRI and discover how you can align your values with your investments by choosing from three basic strategies. Learn to implement these strategies in your investment portfolios and combine your newfound knowledge with the basic principles of successful investing. An up-to-date directory of companies involved with SRI is included. Scott J. Budde, CFA, is a Managing Director at TIAA-CREF Asset Management, the invest-ment management arm of TIAA-CREF, a national financial services organization with over $400 billion under management, and the leading provider of retirement services in the academic, research, medical, and cultural fields. He manages TIAA-CREF's Global Social and Community Investing Department. Budde currently serves as the Vice Chairman of the newly formed International Association of Microfinance Investors and represents TIAA-CREF as a shareholder of ProCredit Holding—a leading microfinance institution headquartered in Frankfurt, Germany. He is a graduate of Bowdoin College and the School of International and Public Affairs at Columbia University. 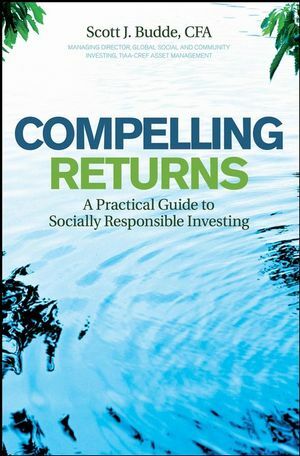 Chapter 1: Getting Started with Socially Responsible Investing. Chapter 2: Sensible Investing Habits for SRI. Chapter 3: Lining up SRI Goals with Strategies. Chapter 4: Social Screening Strategies. Chapter 5: Community and Proactive Investing Strategies. Chapter 6: Shareholder Activism through Proxy Voting and Engagement. Chapter 7: SRI Strategies for Institutional Investors. Chapter 8: Responses to External Critics and Key Questions within the SRI Field. Chapter 9: Yielding to Compelling Returns. Appendix A: Social, Environmental, and Governance Resources. Appendix B: Financial Advisors and Planners with SRI Experience. Appendix C: Social Screening Resources. Appendix D: Community Development and Environmental Investing Resources. Appendix E: International Microfinance Resources. Appendix F: Shareholder Activism and Proxy Voting Resources. Appendix G: Added SRI Resources for Institutional Investors.